Being visually impaired can be limiting at times, often both physically and mentally. Either you can’t see well enough (or at all) to do certain things, or you’ve been told so many times that you can’t do things that this becomes second nature. Limitations can sometimes stifle dreams; however, limitations can also be overcome. When I first met Christi seven years ago (2004), she dreamed of being a traveler and exploring the world. But she had limitations. She couldn’t do it alone; she’d need to be with others who could see. Strapping on a backpack and venturing into the world by herself could only be a dream. She had no option except to depend on others, or so she thought. Over the past couple of years, Christi has been chipping away, bit-by-bit, at her limitations. In particular, she redefined what she could and could not do in terms of traveling. As you may know, Christi is visually impaired. Her right eye is completely blind while her left eye can only tell that the letter at the top of the eye chart is an “E” because she’s read it so many times before. Both of her lenses were removed years ago due to juvenile cataracts. And her retinas are so fragile that they have detached many times in the past, requiring emergency surgeries. This is Christi’s world: through one eye without a focusing lens and a thinly stretched retina that distorts images. By all means she has limitations. So traveling, she thought, could not be on her own terms: to experience the world as a traveler rather than a vacationing tourist. Staying in fancy hotels, joining tour groups and being herded from one attraction to the next was not her cup of tea. Christi wanted to immerse herself into the world, to blend into the local markets, to mingle with the people in the streets, and to eat what they ate and drink what they drank. Back in 2004, this was her dream. No longer. 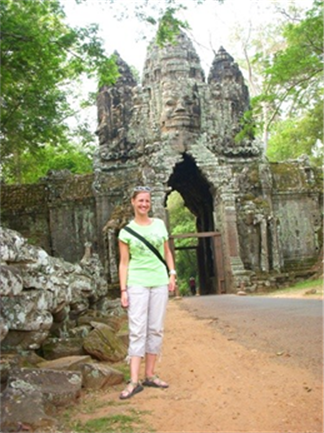 Cambodia April 2011: Christi at the gate of Angkor Wat (featured in the movie Apocalypse Now) on her solo trip. As I write this (July 2011), Christi is traveling by herself in Myanmar, formally known as Burma, a country less visited than the ones surrounding it. 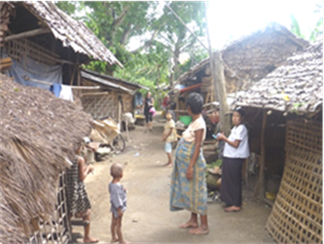 Myanmar is listed by the United Nations as one of the world’s least developed countries, and it is considered a pariah state for its alleged (certain) abuse of human rights and political/global isolation. Hence, the country is not for someone who needs the comfort and security of a developed tourist infrastructure. But for the rugged traveler, Myanmar is the pot of gold at the end of the rainbow. People are super-friendly and traveling takes on a new dimension. Imagine stepping back in time a hundred years. That’s Myanmar. And that’s where Christi is. Myanmar July 2011: Christi explores a village near Pyay as locals are surprised by the unusual visit from a Westerner. In 2004, while we were still working at Intel, we took a ten-day vacation trip in Thailand. Though Christi had been abroad before (Europe), they were either highly organized school trips or with her family. Our trip, however short, was entirely open and we only had each other to rely on. No tour guide, no teacher, or anyone—just the two of us. She caught the travel-bug, and its infection spurred her for more trips. The following year, she and I went to Nepal and trekked to Everest Base Camp. But she was still working, and so she had to return to Phoenix and Intel. In 2007, after much preparation and planning, she quit her job and we went traveling around the world. We started in Thailand, and traveled overland through Laos, China, Tibet (we arrived in Lhasa the day after the March 14th 2008 riot), Nepal, and India. We then flew to Cairo and traveled through Egypt, Jordan, Syria, and finally Turkey. After 14 months on the road, we flew back to the States from Istanbul. During these months, Christi wondered if it was possible for her to travel on her own, thus realizing her dream. She saw the simple tricks I used (remember, I also have visual challenges) when traveling, such as slowing down and taking more time to figure things out, doing a lot of pre-planning, having a sense of orientation and being bold enough to seek the assistance of locals. People’s natural tendency is to help others, especially when they learn that you can’t see well. And you don’t even have to speak their language to let them know—they can tell. It was true. So we switched roles and she led as I advised the general direction for the hotel area. We were now relying on her, and this realization gave her the confidence that, perhaps, she too could travel the world on her own. Christi had always wanted to live and work abroad. This was one of those dreams that she made happen. In the beginning of 2010, with months of traveling under her belt, she got a job teaching English in South Korean coastal city of Busan. It was a major step for her because she was going to be on her own in a foreign country. She flew to Seoul with another American in the same English teaching program, but then traveled by herself to Busan, where she was met at the train station by two Canadian teachers. Christi knows Thailand well and now feels very comfortable traveling there by herself. She knows which buses to take, where to catch the river ferries, and how easy it is to flag down a taxi should she ever get lost. And she also knows where the local markets and the choicest street vendors for dinner and dessert are. She especially knows how friendly and helpful the Thais are, PLUS how fun and easy it is to travel in Thailand. Sampling food in the streets of Thailand. 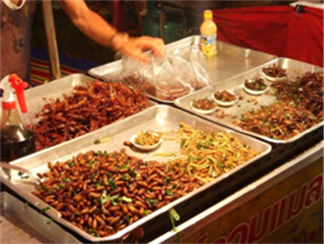 In the photo above, the streets of Thailand have interesting “goodies.” (Luckily, Christi has managed to avoid an insect meal—so far.) 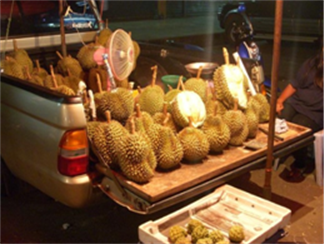 And the tropical fruits are a visual curiosity in themselves! So Christi finally got to Yangon with merely a small pack on her shoulders as she once dreamed. For the four weeks that the visa allowed, she traveled the country on a shoe-string budget and experienced the nooks and crannies that reveal the true character of the country. Christi’s journey may be trivial to some, but look at it from her perspective. For normal sighted folks, put on a pair of glasses with Vaseline smeared all over the lenses. Then cover one eye. Ready? Plop yourself somewhere in a foreign country where language and culture are completely different. And you’re by yourself, with no one to turn to except the locals. The fun begins! My eyes popped open when my ears perceived some change, and I realized with some surprise that I had been sleeping. I looked around and noticed that the bus had stopped, the engine was cut and people were disembarking. The bus had been making regular stops through the night; but this stop was different. Blackness greeted my eyes as I looked out the window – no sign of lights, life or anything. More than half of the passengers had unloaded, leaving their bags behind. Guessing that we would be parked for some time, I made my way to the front of the bus, stepping over baggage, sacks of rice and folding jump-seats that blocked the aisle, and stepped out into the void. The darkness welcomed me with fresh, cool air. I breathed deeply. Thus far, the ride had been a harrowing eight-hour journey over horrifically bumpy, mostly unpaved roads that winded around a nonstop sequence of hairpin turns as we ascended and descended through the mountains. The bus was small; people sat hip to hip and elbow to elbow, swaying in unison at every switchback. Even the aisle was occupied. It had a seat that unfolded for the unlucky person who’d have to share his or her leg room with bulging sacks of rice. I sat three rows from the back and found myself to be seemingly the only person who had not been overcome with motion-sickness. This I attribute to motion-sickness pills, and I thanked my lucky stars that I had remembered to buy some before leaving Thailand. Plastic baggies were passed behind me, in front of me, and even to the kid who shared the seat next to me. It's no wonder people were eager to seize a chance to get a bit of fresh air and stand on solid ground. Outside, I stretched everything I could. I surveyed the scene: mostly, I saw a sea of darkness interrupted by a few headlights suggesting that there was a bus in front of us and another behind. I heard clinks and clanks and surmised that the bus in front of us had broken down, and we had stopped to join in the roadside repair job. Drivers here help each other out since, eventually, every driver will take his turn needing assistance. 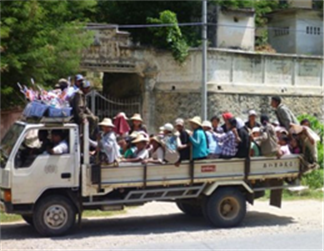 Buses in Myanmar are old and are notorious for breaking down along the road. The bus host (who collects money and assists with baggage) handed me a bottle of water. I was the only foreigner on the bus, and likely, I was the only foreigner around for a good distance. Mandalay and Yangon were hundreds of miles away. Standing there in the dark somewhere in a country sandwiched between Southeast Asia and South Asia, I realized how far removed I was from anything familiar. The poor infrastructure that made crossing even a hundred miles an all-day ordeal solidified my sense of isolation. I stuck close to the bus to make use of the gleam of light coming through the windows from inside. As I took a sip of water, I noticed two women standing nearby and watching me, pulling at me with their smiles, so I smiled back at them. This broke the barrier that separates strangers. “What is your name?” asked the woman on my left. She was holding a baby. Despite the country’s poverty and its infrequent visits from foreigners, a lot of Burmese speak decent English. Up until 1948, Burma was part of the British Raj, a period of British colonial rule in South Asia from 1858 to 1947. After the British left, the Burmese people continued to put a high value on teaching English to their children. They see it as a path to opportunity. I was ever so grateful for how prevalent English was in Burma! Not only could I ask questions whenever I got lost or needed help, but I could also have proper conversations and get to know a little bit about the people. Granted, most conversations revolved around similar topics: age, nationality, marital status, work, and length of visit. And these questions always came with a warm smile and fully engaged eyes that wanted to know about the world outside. I was talking to both women, but the woman with the baby was far more outgoing. While many Burmese can speak English, most are too shy to do so. Then I heard a very quiet, “What is your name?” coming from over my shoulder, and I noticed a young girl leaning out of the window. She had been watching us, gathering the courage to talk to a foreigner. After some time, the bus in front managed to turn over its engine. As it rattled and revved, everyone jumped into motion. Our own bus cranked its engine, and I started to make my way back in. “No, no!” a voice called out to me. The shier of the two women with whom I'd been chatting tapped my arm and motioned for me to follow her. I did my best to keep up, but it was dark and the road was an unpaved mess of muddy trenches. She noticed my plight. My cautious steps and absolute dependency on the light cast by my headlamp made it obvious that I couldn‘t see well. She took my arm and guided me across the road and around a corner and, to tell the truth, I was not sure where else. The bus pulled around to meet us, and we all filed aboard. As I settled into my seat, murmurs in Burmese interspersed with, “Christi,” and, “USA,” spread from row to row, like a game of Whisper Down the Alley. The woman with the baby was telling everyone all that she had learned about me. We looked at each other and smiled. I never imagined that I could travel on my own, much less to Myanmar, and I certainly never thought I would be traveling in the middle of nowhere at night in such a place. But there I was. Surprisingly, it wasn't nearly the impossible task I thought it would be. Had I been in the middle of nowhere and truly alone, sure, that would be impossible for anyone. But I was surrounded by people. The Burmese people are some of the kindest and most eager to help that I have ever met. Such experiences are more priceless than seeing the wonders of the world. Such memories are much more intimate than photos. “All aboard!” One of the more reliable trucks. A Burmese family in Pyay I spent time with.